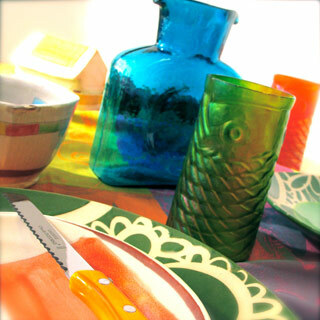 Mackerel Sky has always been about art and function; bringing art to articles of everyday life. By registering with us for your special day, we hope to give you the chance to build your new home and life together with that in mind. Every week we have customers come in looking for wedding presents, because they don't want to purchase a cookie cutter gift. We hope to show you the other side of wedding registries! Come visit the gallery to hand select what are sure to be your new favorite pieces. For options apart from what you see on our shelves, we can special order directly from the artist. In most cases, ordering ceramics in one order makes for the best, most even consistency in the glaze, as well as making it easier for the artist's production schedule. When opening a wedding registry at Mackerel Sky, we hope to personalize the experience entirely, offering a custom web page for the convenience of you and your guests. Of course, we are happy to gift-wrap any purchases with our fabulous purple bow, as well as ship your gifts to any continental U.S. location. Feel free to give the gallery a call to set up an appointment to create your wedding registry today!